Now, following on the heels (hooves?) of a post about the Shepherd of Psalm 23. . . . Being a literalist and a bibliophile, I wonder (but don’t actually query aloud), “Oh, really? And can you say how you cared for those sheep? When we hear and use the word “pastor,” we ought to relate it to a pastoral scene or to pasture — and then to the living beings that pastor and are pastored. Biblically, speaking, it’s a mistake to think of pastor as “senior minister” or “church administrator,” which are wholly different — not to mention non-biblical — ideas. Pastors are supposed to care for sheep, you know. Like other in-house-Christianese terms, the origins of the word “pastor” are not confined to “church.” Pastoring ideals might well be considered in settings other than church. I’ve worked in varied places, with a lot of different bosses. If we assume, for sake of discussion, that most bosses do care about their employees, the pastoral analogy in the workplace isn’t that much of a stretch. I have been an employee of four Christian establishments and a dozen secular ones. In my experience, most bosses have been better than average. Some were surely better than I remember, even, but I was probably too impertinent to perceive how good they were to their “flocks.” Very few supervisors have in reality been very pastoral, although many of them might have had some very sincere thoughts about this kind of caring. Could a boss ignore the sheep when they needed her . . . even or taunt the sheep? Could you imagine one that ran a sheep through with a pitchfork while he dozed, then walked away calmly, without apparent pang of conscience? Ever had a boss that pushed his sheep out of the pen so they’d be subject to the wolves? Or one that talked about how much she cared more than actually showing that care? Or one who never came out of the supply shed long enough to see what the sheep were up to in the pen? At least one of my bosses spent so much time in the sheep-muck that he was all mucky when he tried to get off his hands and knees to look up into the lambs’ eyes. This is not a boss that one can depend on as a shepherd. The best bosses I ever had were arguably the most unlikely. In one case, the care was evident and consistent. In another case, you had to look a little deeper, but you were always treated well. In churches, it’s also been a mixed bag. Some pastors actually pastor on a regular basis, but more of them may be caught building or tearing down pens, negotiating deals on animal feed, considering grass type & pen landscaping & and overall farm size, etc. Way too many “pastors” hire others to do the pastoring . . . and then no one actually ends up doing it, anyway. Ever heard of a “worship pastor”? I find that to be a sort of double-misnomer—first misappropriating the term “pastor” as everyone else does, and piling on the mistaken notion of pastoring the worship, as though the worship itself is a sheep. Of course, what the term really purports to label is the man (or woman) who pastors people in the course of worship leadership — a conceivable scenario. The worship teams are seen as the primary flocks to be shepherded. I’d have to guess that my “shepherds” back in Delaware most closely approached being pastoral with me. 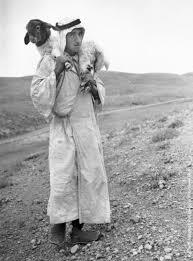 I can’t recall any would-be shepherds (nominally speaking) since that time that were any better. Still, the structure in which those Cedars men operated, not to mention their human ineptitudes, kept them from much essential pastoring. Recently, a man with no pastor’s title tried to care for me in a very shepherd-y way. I appreciated it. And I wished there were more relationship “chemistry” on which such care could have rested. Alas, our American lifestyles do not often allow for such relationships to be built. We sheep stumble and slosh down muddy paths, hoping to be able to climb out of ruts and clean our hooves later, all the while feeling that those hooves have some prickers in them that are going to keep hurting for a long time. A now-deceased man was called on to be a shepherd-elder in a church. He didn’t want the job but was persuaded by a passionate appeal from a sister. And he made a difference, although probably more in terms of administration than in actual shepherding. Where are the shepherds to care for the sheep? Who has a shepherd’s determined heart these days, and in what types of activities might that person be found shepherding? Why did I title this “Loosie”? Because my cousins Scott and Rachel had a little lamb that got loose, and they called her “Loosie.” Not incidentally, Scott’s “pastoral” care for this little lamb resulted in the lamb’s following Scott around. We humans aren’t always clear-headed. Presumptions frequently encroach — in arenas in which otherwise rational consideration is the norm. Below are a few samples. . . .
. . . presumptions of bloggers who come off as though they think they know more than they do [and presumptions of blog readers who may think the bloggers think they know too much] . . . It is irrational to think the eyes must be looking directly at the road at all times. It is irrational to think the hands may not do anything but grip the steering wheel. 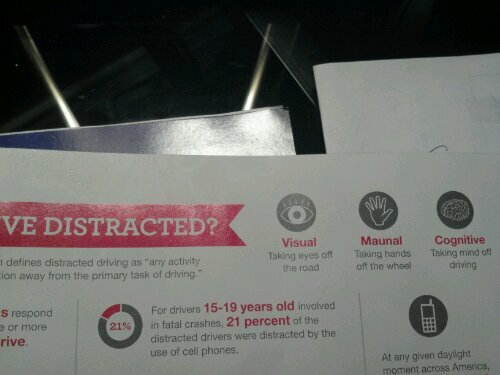 And it is triply irrational to think a driver cannot think about things other than driving. I’m for safe driving, although I admit I’m not always the safest. A driver must know his/her own limits. We cannot legislate everything, and we look presumptuous and silly when we try to. To the extent that the author of this article in a university alumni magazine seeks to legislate safety, s/he needs to get off the elevated equine and stop presuming that that can or should be done. Not all presumptions are evil or even unwise, but they should be recognized as presumptions nonetheless. ¹ Ya think someone writing up this thing about distractions might have paused to wonder whether s/he were distracted while writing it? It’s “manual,” not “maunal.” Good grief. Yesterday, I commented on the first three words above. They are distinct from one another and yet, when considered together, help to form a more complete picture of one type of Christian leader. In the process of writing this blog, I began to wonder more about the significance of the word hegoumenoi. Curiously, as of this writing, my blog is the only one referenced by WordPress as dealing with this word, and I’m a little surprised at that. I’d previously almost discounted this fourth word, not being sure whether it is properly applied to a) church leaders or b) community leaders, and how far to take the idea of “obeying” (Heb. 13:17). It’s a rather unique exhortation–to obey church leaders, that is–and as such, I’ve wondered how applicable this word is to church leadership. Hegoumenoi is, according to Kittel, used of “community leaders.” Hmmm. While this could run parallel to what Paul demanded in terms of the relationship between the Christian and government–does Heb. 13:17 mean “be subject to civil/community authorities?”–I wonder whether the Christian community might be in evidence here more than the civil one. If the purview here is the church and nothing larger, then thinking and believing and regarding–“soft skills,” the business world might call them–could be understood as elements of Christian influence and relationship. If — and I do say “if” — I’m onto something here, then the hegoumenoi could easily be taken more as influential leaders in the Christian community. Since the word-concept “community” is one particularly apt description of what church should be, I’m drawn by this idea. If church is community, and if community presupposes authentic relationships, it follows that “community leaders” are to be heeded and respected. Leadership and obeying would not be, then, because of positional authority (which I believe is foreign to the New Covenant), but because of experience and trusted relationship with leaders of a community. All this begs the questions of fallen human inclinations, and breakings of trust, and stupidities, and spiritual imbalances, and what may be seen as pie-in-the-sky vision for church as community. I mean, really, we’re all so busy and fragmented and weak and mobile and fickle … and we all make so many mistakes … that genuine hegoumenoi and true Christian community can surely never be found over the long haul. Not in this life. Ever since I learned the first word, I’ve loved it. There is so much shepherd/sheep imagery in scripture, and this concept of poimen is richly descriptive of caring for a group. In any NC writings that are clear on this subject, poimenoi is a plural group. Notably, 1 Peter 5:2 is a word from an apostle who views himself as a sort of “fellow shepherd” (NOT as a fledgling “pope,” mind you!) to other shepherds. I suppose that since Peter’s audience is a group of churches, not a single church, it might be that there is a single poimen in some church, but never do the NC writings assume one man has charge of a church. I knew a man who was an “elder” of a church at 35. That made sense, because he had been a Christian for 20 years, had a believing family, and was in a very young church. (Then there are those Mormon “elders”–20-year-olds sent on missions. Not a silly practice, but a downright ludicrous label for them.) The human context is important when considering the age factor: if there are wise, spiritual men in their 60s, 70s, and 80s, no 35-year-old should be a presbuteros. When disagreement occurs over doctrinal or procedural matters, I am hard-pressed to ignore the simple fact that I have been a Christian leader longer than one of my church’s presbuteroi has been a regenerate believer. I don’t often claim much wisdom. It’s not one of my gifts. 🙂 But I do have experience, and even though a “presbuter” may have a few chronological years on me and is in some ways a better “shepherd” or “overseer” than I could ever be, I could actually function as his “elder” in the faith. I tried to squelch this observation a few weeks ago; truth be told, I’d prefer not to think about it. But the man’s lesser spiritual experience (here, I’m avoiding the word “maturity,” because he’s probably more mature than I in several respects) keeps rising in my consciousness. In the neo-Protestant vein, it’s time for a pickin’ and a frownin’ (apologies to Roy Clark and Buck Owens of the old country variety show Hee-Haw). The name of the church has been changed to protect the guilty. These bits come from a church bulletin near you. I intend to pick at them. WELCOME…The Main St. family extends a warm welcome to our visitors. How do you know this to be the case at the time that the bulletin is printed? These types of comments sometimes get inserted when the church is not actually that warm, but wants to become so. We are thrilled you have chosen to worship with us today! Well, okay … assuming there is actually worshipping going on, which happens to be the case fairly often at this church, but not at all churches! Sometimes churches cancel stuff too often for fear that no one will come because something else is going on. If a bit of a schedule crunch appears to crowd out an event, it seems to me that said event wasn’t that well founded to begin with. Oh, and P.S. … VBS is outmoded. It’s OK to have another study/learning opportunity, but the notion that VBS will actually bring in unchurched people is kind of silly. I sometimes wonder what the non-Christian people who drive by the fancy VBS signs think. Most likely, they think nothing at all, but they surely aren’t going to go “Oh, wow. Vacation Bible School is at that church next week. What a wonderful thing they’re doing. I think I’ll take my kids just to see what it’s all about.” Such thoughts once inhabited the wishful minds of the most evangelistic on the VBS planning committees, but if they abide in this day and age, they are nearly pointless. Unless there is a guy with the first name Sickler, this punctuation is incorrect. Assuming the family name is Sickler, it should be Sicklers’. It’s the rare church secretary who knows how to form plurals and plural possessives of last names. Growing Deep and Spreading Out as we live the Great Commandment and the Great Commission. Now this “mission statement” or “purpose statement” (take your pick—I’ve never figured out which was which) is more catchy than some—like “We exist to love God and love people” or “Worshipping, Serving, and Reaching Out.” But the Great Commission has a biblical context, and it doesn’t seem to be on par with the so-called Great Commandment to me. The former is specific to those the Lord spoke it to, and the latter seems more broadly applicable. Ergo, I really don’t buy in to the notion that Christians today should be all about the Great Commission. By extension, there’s some application, but I’m not interested in picking up deadly snakes (Mark 16, long ending). Elders top the list, as they do in any good Church of Christ. Then the so-called “Minister,” a guy who happens to be paid for preaching and doing various other things. Then the Deacons, who would appear to be subservient to those above them in the list. Deacons are not junior Elders, and the minister might just as well appear in the list of deacons: there is ample etymological reason to consider him a deacon. He should not be thought of as a category of leader who has almost as much power as (or more than!) the elders, and more than the lowly deacons. In fact, no one in the church should be thought of as having any power at all. This is not to say that there exists no power or authority vested in roles, but it is to say that churches—and especially those actually in these leadership roles—should not act and react in such a way that shows they are wrapped up in hierarchy. I just don’t see the need to take up space printing names of who serves in which role. Regular members already know, and visitors probably don’t care too much. I think my biggest, broadest beef with church bulletins is that the value of them isn’t high enough to justify the time they take to put assemble and print. I can well imagine that about half of your basic part-time secretary’s time is taken with the bulletin every week. And in a church in which 200 copies are printed, about 70 of them are nothing more than recyclable. Someone generally reads aloud many of the printed announcements, and those lists of who’s doing what in the assembly … oh, don’t get me started. The lists always end up being wrong, so why print them in the first place?! “Christ receiveth sinful men.” So goes the first and final lines of the chorus of a gospel invitation (altar-call, if you prefer) song. And, despite its outmoded verb tense, the line expresses truth! Today I’ll expand on a few thoughts from yesterday on church roles–those of the elder and preacher/pastor, particularly. I’m no church history scholar. Just a passive observer who picks up a tidbit from time to time and has a few study resources. What I do, instead of researching historical developments and discursively discussing timelines and influences, is to compare my understanding of scripture to church practices as I observe them. And I see sinful men receiving sinful men a lot. The focus gets a little blurry the way we do things sometimes. Who receives confessions in your church, and how, and why? I remember Lynn Anderson (gifted communicator, above-average writer, and Christian leadership mentor, with the true heart of a servant leader himself) in a presentation once. He mentioned the previous church he had served as preacher, saying the shepherds/elders of that church had “freed him to take more of the prophetic role.” In saying that he was in no way implying a miraculous foretelling gift, or even of speaking as the oracle of God, per se. He was saying that his role in the pulpit was primarily to speak the things of God, regardless of how much they ended up pricking hearts and poking souls and quickening tender consciences. Then, Lynn said, after he spoke, it was the shepherds’ role to stand up front and receive the sheep who needed help. Now, I call into question the effectiveness, if not the very conception, of the invitation song or altar call. This event is a completely human invention and seem to me to put souls to sleep more than it enlivens spirits and encourages true repentance. Seems to me that confession finds a more effective avenue in free, non-obligatory, private (read: not in a booth with an authority figure!) conversation or in small groups than in the congregational assembly, but to each his own. . . . If a church is going to have an invitation, it surely seems to me that it’s more appropriate that a shepherd (remember, the pastor, biblically speaking, is a shepherd; this role is more closely tied to that of the elder/bishop than to that of the teacher/preacher/evangelist) receive the confessions, the wounded, the needy, the responsive. The preacher, if there is one, speaks the words that lead to the response. The shepherd is the one who, by definition, cares for the sheep. At some point in my teens, I decided that I was not going to be a preacher. So many Christian boys of my heritage seem to have been encouraged to train to be just such a church servant, but not me. I don’t remember ever hearing such an admonishment, despite having been one of 2 or 3 standouts (if I do say so) in a group of 10 or 12 my age in Bible classes. My parents apparently had other dreams for me, too. I learned early on that the most spiritually significant congregational “office,” if one called it that, was that of elder. And I aspired to be one. Later, I discovered that not all those technically qualified to be church elders (see 1 Tim. and Titus, primarily) actually wanted the role. And some who wanted the role weren’t technically qualified. If a man didn’t aspire to that “office,” well, then he shouldn’t be in it. Later, I married. I thought I might be an elder one day, since I had met one of the qualifications–to be husband of one wife. Later, I learned that many saw the role of deacon as a proving ground for the role of elder. Deacons were and are, in many churches, junior elders working their way up. Later, I became convicted that there was to be no hierarchy in Jesus’ church, but that humans had messed that up. In our fellowship, the elders were at the top (which is the least of hierarchical evils, i.e., if one must think of someone at the top, it should probably be the elders), and the preacher was next, practically speaking, and the deacons were next down the list, and then the rest of us. Later, I was influenced toward the strong (and biblically bolstered, I believe) notion that elders should be shepherds, primarily. That is, they should *not* function primarily as members of the congregational board of directors, but rather, as spiritual caretakers of souls. I became rather rabid about moving away from the business model. The very idea of “working your way up” some supposed church ladder, as in the business world, was, and is, repugnant to me. Later, I added to the above conviction that elders/shepherds should not function primarily as a collective body at all; rather, they should care for souls individually. I don’t present this as absolute; it was probably a reaction against what I was reading and seeing in other churches–that groups of elders wielded more clout and power than spiritual influence. Later, I divorced, which meant that I would not be an elder or deacon–ever, in many churches. As I say in my “personal snapshot,” available on this blog, I am not proud of being divorced, but I am glad to be married to Karly now. So I began to wonder anew if I might be an elder or deacon. But I don’t feel wise enough to be an elder, plus, I felt it was probably not a good phase in life to start having children, so that pretty much cut me out of being either an elder or a deacon, scripturally speaking, in churches that adhere to those general guidelines (which is where I would tend to find myself in church). But then came Jedd Garrett, our son — a blessing from God. I am wondering if I might be a deacon or elder someday. But I still feel that I’m not wise enough.